Add Dolby Atmos and DTS:X to your home theater's repertoire without cutting holes in your ceiling. Immersive audio technologies such as Dolby Atmos and DTS:X create an incredible three-dimensional sound field that simply blows away traditional multi-channel home theater. Once you hear it, you just can’t go back. If you’ve longed for immersive audio in your home theater, but balked at the thought of installing speakers in your ceiling, MartinLogan has a fantastic solution. The company's Motion AFX, $599 per pair, are Dolby Atmos-enabled speakers that deliver all the benefits of object-oriented soundtracks such as Dolby Atmos and DTS:X without the hassle of opening your ceiling. How do the Motion AFX perform their magic? Dolby Laboratories, the company behind Atmos, knew that most consumers wouldn’t be able to install in-ceiling speakers. So, with some creative thinking, the laws of physics, and a bit of psychoacoustics, Dolby came up with a slick solution aptly called a Dolby Atmos-enabled speaker. To be labeled as an Atmos-enabled speaker, a speaker must conform to Dolby’s standards. All about object-oriented audio technology such as Dolby Atmos. An Atmos-enabled speaker sits on top of an existing flat-top speaker or on a speaker stand above ear height, but is angled to bounce sound off the ceiling down to your listening position so that you hear the sound coming from above you. It’s comparable to bouncing a ball off the ceiling so that it reflects and comes at you from above. For that effect to happen, an Atmos-enabled speaker like the MartinLogan Motion AFX must point at your ceiling. The Motion AFX’s drivers, comprised of a 0.75-inch aluminum dome tweeter and a 5.25-inch polypropylene cone bass/midbass driver with a stamped steel basket, are angled upward within the speaker cabinet. When source material containing height information is played, the Motion AFX projects that audio signal towards the ceiling. The Motion AFX’s top has a perforated grille that hides the angled drivers. If you shine a flashlight through the Motion AFX’s grille, you’ll see the drivers on the top of the speaker against an angled ramp. Even though there’s a perforated grille at the front, the speaker has no front-facing driver. 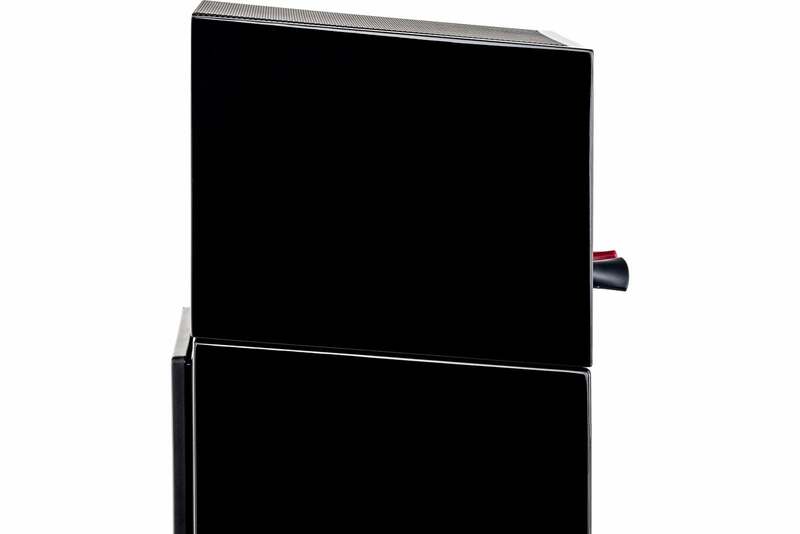 The front is completely blocked off and no sound can escape directly toward the listener. Simple and smart. The Motion AFX is far smaller than typical bookshelf speakers. It’s more like a large cube. The reason for this is that an Atmos-enabled speaker doesn’t have to cover the vast frequency range of a typical speaker. Indeed, the Motion AFX’s frequency response is only 90Hz to 20kHz. Frequencies above 80Hz are directional, while frequencies below that are not. 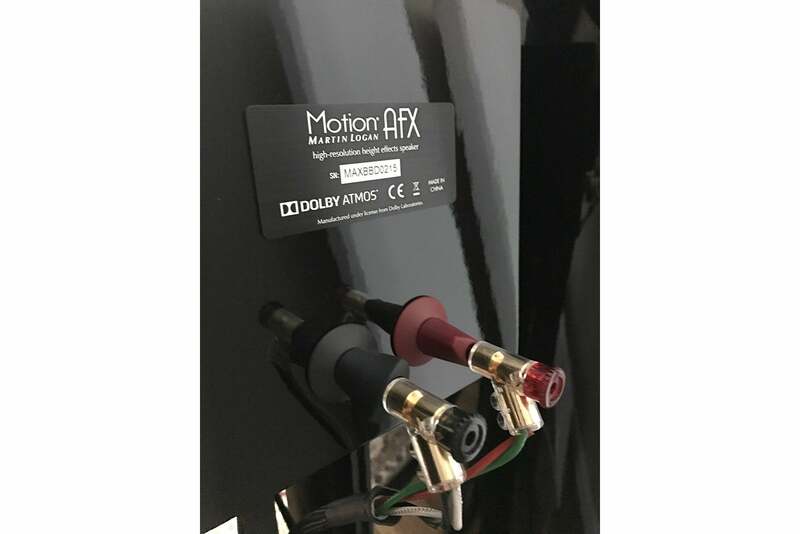 Therefore you always set the Motion AFX as a “small” speaker in your A/V receiver, though modern room correction systems typically take care of this for you automatically. MartinLogan’s oval-shaped five-way binding posts are superb and easy to tighten. You can use spades, banana plugs, or bare wire. The Motion AFX have an angled, parallelogram look to them and a high-gloss, piano-black finish that mates them perfectly to Martin Logan’s Motion series loudspeakers, although there's nothing to prevent you from pairing them with any flat-top speaker. The only caveat is that the Motion AFX will look more like a rhombus when paired with non-MartinLogan Motion series speakers. Even though the Motion AFX are a 4-ohm speakers with a sensitivity of 87db, MartinLogan says you can drive them with any compatible 4-, 6-, or 8-Ohm amplifier. In other words, your current Atmos-enabled receiver will do just fine. Will the Motion AFX work in every setup? Unfortunately, you can’t use the Motion AFX in every home and every setup. The laws of physics do have limitations. For the Motion AFX’s bounce effect to work, you need a flat ceiling ideally between 7.5 and 14 feet tall. You also want hard, reflective ceiling surfaces such as drywall or plaster. Sound-absorbing ceiling tiles aren’t a good option You won’t get good results from cathedral or vaulted ceilings either because the sound won’t reflect properly. MartinLogan’s Motion AFX speakers aren’t good options for Auro 3D,either; that's a competing immersive audio format that requires discrete speaker height channels. There are a few other things to keep in mind. You can place the Motion AFX speakers either on top of your speakers (assuming they have a flat top) or within three feet of your speakers on tall stands. If you place the Motion AFX on top of your speakers, you won’t need to worry about scratching their finish. The Motion AFX come with a soft, scratch-resistant dampening material on the bottom. 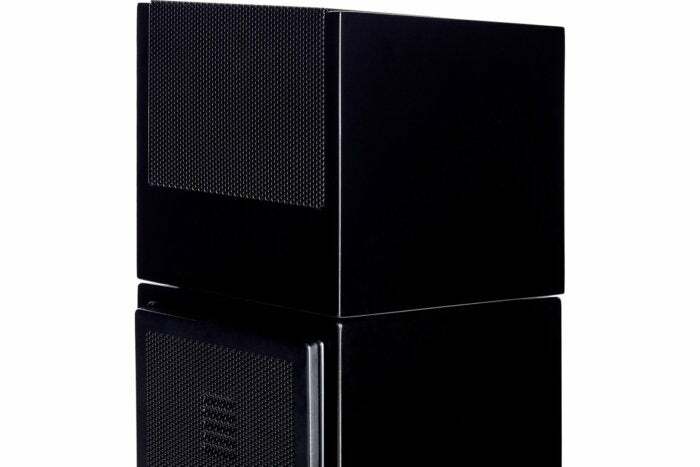 MartinLogan’s Motion AFX speaker is angled to match its Motion-series speakers. 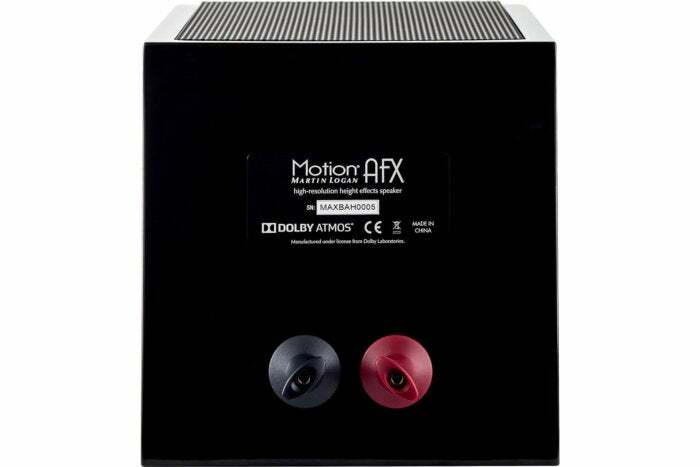 However, you can use the Motion AFX with any loudspeaker. A final, important note: Install the Motion AFX above your ear height, but lower than half the height of your wall. If you don’t, you might hear the speaker’s sound coming from the front and the sonic illusion will collapse. Do the Motion AFX really work? I tested the Motion AFX in a room with a 9-foot ceiling as part of a Dolby Atmos and DTS:X 5.1.4 setup (five main speakers, one subwoofer, and four Motion AFX speakers). I used a high-end Anthem AVM 60 preamp processor, which can support both Dolby Atmos and DTS:X setups, along with an Oppo UltraHD Blu-ray player. Using the AVM 60’s slick capability of loading multiple speaker profiles, I configured one input dedicated to a 5.1.4 Dolby Atmos and DTS:X setup. The second input was configured for a traditional 5.1 setup and would decode the regular multi-channel Dolby or DTS surround mix. I could therefore switch between the two and hear any differences in an A-B scenario. I played a variety of Dolby Atmos and DTS:X sources and likewise used the Dolby Surround and DTS Neural:X up-mixers, which take a traditional 5.1 or 7.1 movie soundtrack and extract height information to play it with an immersive audio presentation. I’ll confess that I’ve been a bit skeptical of the Motion AFX speakers and Atmos-enabled speakers in general. About a year an a half ago, I set up a Dolby Atmos, DTS:X and Auro-3D immersive audio setup in my basement with dedicated in-ceiling speakers. The effect is astounding. Could these up-firing speakers really work and give my dedicated setup a run for its money? Well, it didn’t take long for my doubts to be erased. Firing up the Ultra-HD Blu-ray version of X-Men Apocalypse with its Dolby Atmos track put me on notice. During the scene in ancient Egypt where the X-Men’s nemesis Apocalypse is about to transfer his consciousness to another mutant, a revolt ensues. Guards collapse a pyramid with Apocalypse inside. The Dolby Atmos mix created a superb sense of space. My walls and speakers disappeared and I heard rocks fall from overhead as the stones and debris entombed Apocalypse. The oval design of of MartinLogan’s signature five-way speaker binding posts make tightening a breeze. At about the 9:21 mark, the scene has shifted to a high-school. I heard a class-ending bell emanate from the upper right part of my room even though there were no speakers there. About a minute later, Scott Summers, aka Cyclops, has run into the boys' bathroom and is struggling to control his mutant powers. A bully from the football team pounds on the stall door where Scott is hiding. Scott opens his eyes and his optic force blasts rip a trench into the bathroom wall and then upwards into the ceiling. When Scott closes his eyes to stop the blast, you hear the delicate flutter of dust and debris literally falling from above and all around. Several other scenes from the X-Men Ultra HD Blu-ray, such as Apocalypse’s escape and the ensuing thunder claps heard by Mystique and Nightcrawler, echo overhead with stark realism. While overhead effects are superb, what really seals the deal is the way a Dolby Atmos mix creates a natural, enveloping sense of space throughout the movie. For example, when Charles Xavier enters the Cerebro chamber to see the cause of these global tremors, you sense the vastness of the space around you. I had the same experience with other Atmos titles, such as the remastered version of The Fifth Element. During the opening credits scene, there is just a seamless sphere of sound. Don’t think that a Dolby Atmos mix or height channels make a difference? I switched repeatedly between the two inputs on the Anthem and the comparison wasn’t even close. For example, when the rotund Mondoshawan aliens land in Egypt, the Motion AFX and the Atmos soundtrack created a superior, enveloping, natural surround field. Shifting down to the regular surround mix and things became more forward and far less three dimensional. You can mount the Motion AFX on top of your existing speakers or on speaker stands, as long as they are above your ear height when you’re seated. I installed the front pair of Motion AFX on tall speaker stands and the rear pair on top of tower speakers. Oh, and in case you’re wondering, the Motion AFX worked tremendously well with DTS:X mixes too. I fired up the 2016 DTS Demo disc that contains some DTS:X movie clips and music mixes. I played Imagine Dragon’s DTS:X mix of “I Bet My Life.” Wow! The mix in DTS:X is intense. I could distinctly hear the chorus of clapping from the refrain through a deep and rich front and back height soundstage. I kicked back down to the regular DTS mix and I couldn’t believe the difference. It was flat and lost the energy, dynamism, and dimensionality of the DTS:X mix. Put another way, if more artists mixed their albums this way, I’d buy them in a heartbeat. How do the Motion AFX compare to dedicated in-ceiling speakers? I have a dedicated 7.1.4 Dolby Atmos setup in my basement, and I can say that I was surprised—no shocked—how close the Motion AFX speakers came. There’s definitely a difference between the two setups with the dedicated in-ceiling speakers providing a more precise sound field. Nevertheless, living with the MartinLogan Motion AFX speakers has completely changed my tune about Atmos-enabled add-on speakers. Major audio advancements don’t come often, but when they do, the effects can be astounding. Going from mono to stereo, stereo to multi-channel, and now multi-channel to object-oriented audio represents a sizable leap in performance, realism, and engagement. If you’ve wanted to embrace Dolby Atmos and DTS:X, but weren’t sold on Atmos-enabled speakers, then doubt no more. MartinLogan’s Motion AFX speakers can transform any setup and speaker system. 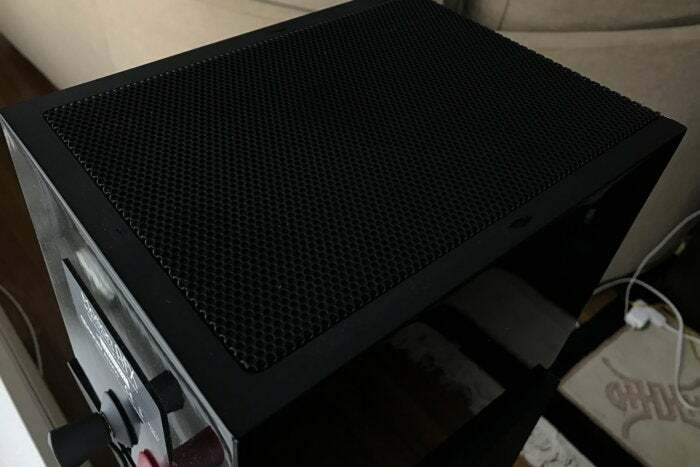 If you have an Atmos and DTS:X capable receiver and your room conforms to the required physics, run out and grab a set of MartinLogan’s AFX speakers. You won’t look back. 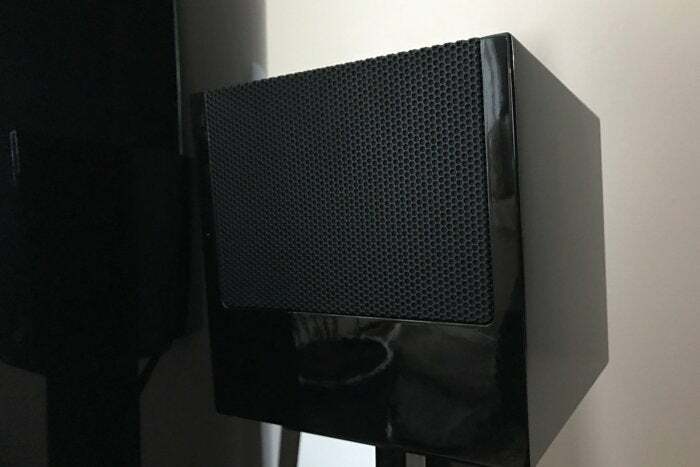 Provided your A/V receiver is capable, these speakers deliver all the benefits of object-oriented soundtracks such as Dolby Atmos while sitting on top of your existing tower speakers; plus, you don't have to put holes in your ceiling.